It is above my island in the kitchen. 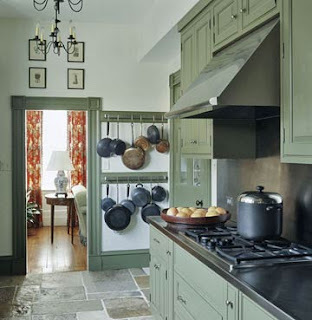 I like the light fixtures. But.....I think it needs a little change. Our home is a cross between French Country and a English Cottage. 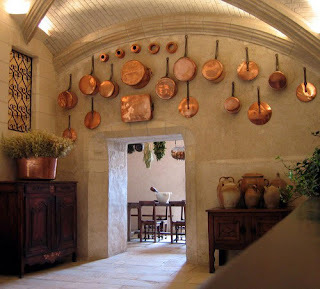 So I have been thinking pot racks.French kitchens always have copper in them. And I love copper. 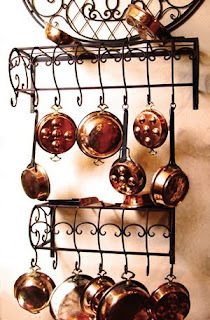 I've had copper pieces in my kitchens ever since I was first married, more than 28 years ago. The trouble with the lights is they put out a funky glow in the kitchen. They are not a task light and since I do most of my tasks at this island I need something else. 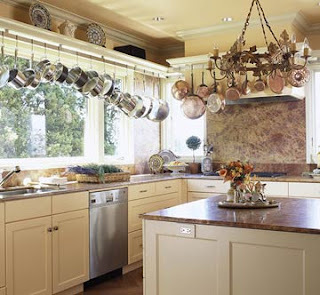 Do I buy a pot rack with lights already in them (keep in mind I have two electrical boxes) or do I buy new pendant lights and put a pot rack in between? Here are some options that I am considering. I could use two of these. As you can see there are 2 light fixtures in each. That would give me quite a bit of light. Or, how about this one? I could put this in between two pendant lights. I love the color of the metal. Here are a few more ideas that could go on the wall. If I decide to only change the light fixtures. This last picture is a little to busy for me but I still like to look! I believe inspiration comes from really looking at all different styles! For $6.00 a bunch I bought a little bit of Spring today. I was out to lunch with my mom and sister and on my way home I noticed a sign that said," Tulips $6 a bunch." I quickly took a sharp right almost hitting the car next to me. But I needed some spring today! It is a wind chill of -13 below tonight and tomorrow is a high of 1 degree. Ugh! Fresh spring flowers just make me feel better. So go out and buy yourself a little bit of spring. It doesn't have to cost much but it sure puts you in a happy mood! Love It! But at what cost? I love Viva Terra. 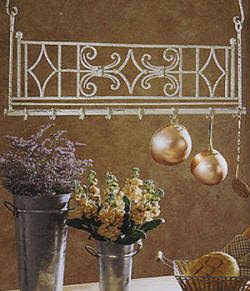 It's a great catalog with all kinds of stuff that just calls my name. 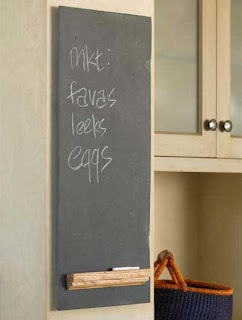 I have the perfect place for this vintage real slate chalkboard. After using a chalkboard for years to keep my kids organized, I now need it to keep my menopausal-self organized. It's great to write the days of the week and then put down what ever I have going on each day. But at what cost? At $175 plus shipping and tax I am looking at $209. I think with some help from my step-dad I will try to tackle this myself. He can use a saw and I love chalkboard paint. So.... I will update you on my new chalkboard! 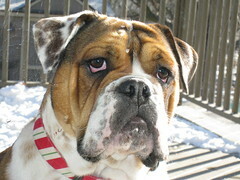 To know me is to know my 3 year old English Bulldog, Lulu. She make me laugh everyday. Bulldogs are stubborn and Lulu is the worst. Don't get me wrong, she's been to obedience class and we are always telling her "NO". But Lu does what she wants, at her own pace. Actually she's really a pretty great dog. Just a little slow to react. So if I say Lulu this or Lulu that, you will know who I am talking about. Seriously, how could you not love that face!! 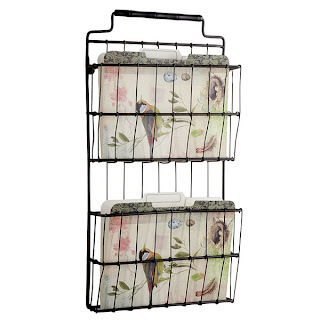 This is a wall file folder. I love the bird folders that come with it. It will work great for bills that need to be paid and bills that are already paid. 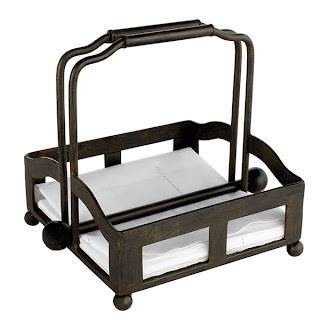 How about this great looking napkin holder. This will be great for outdoors. I can't wait for warm weather! How about you? I am not sure how to write my first blog post. Should I write about something important? Try to say something funny? Post an interesting photo? Or just write about whatever is on my mind? I guess there is no right or wrong way. So for me I think I will just write about whatever comes to mind. Wow, this could get scary! !